﻿ Dumb Possum - How Smart Are Opossums? Dumb Possum - How Smart Are Opossums? 06.16.2003 - I read in a wildlife book that the North American, or Virginia, Opossum has the smallest ratio of brain mass to body mass of ANY mammal in the world. I actually don't think that's true (armadillos for example seem to have teeny heads and big bodies), but I certainly do acknowledge that the possum's brain can't be very large, and that the animal doesn't use much of what it does have. 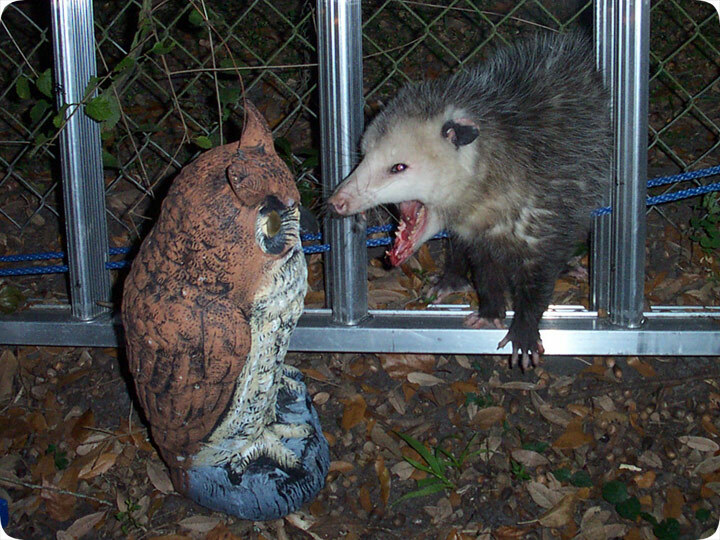 Opossums are dumb! They're so dumb that they let their ears freeze off in the winter instead of seeking shelter. They're so dumb that I've chased them and they run into walls. Sometimes they just stand there with their mouths open, but then don't even have the sense to bite. This here possum in this photo wern't too smart. I caught it using an emptry trap with no bait. Then when I opened the cage to let it go, it walked the opposite directon into the back of the cage. Then it wandered across the yard and encountered a fake plastic own and tried to get into a fight with it. This opossum so dumb it waited all day at a stop sign. This opossum so dumb it got hit by a parked car. This opossum so dumb it thought Meow Mix was a CD for cats. This opossum so dumb it climbed over a glass wall to see what was on the other side. This opossum so dumb it tried to kill a fish by drowning it. So yes, opossums are stupid, but they're also great survivors. They make up for their lack of brainpower by being immune to nearly all diseases and by being able to eat almost anything, even Taco Bell. They don't live long, and they have a knack for getting hit by cars, but they do manage to breed quickly and find shelter inside attics of homes, so that's all it takes. They're good at eating, mating, and sleeping, so I guess in that sense, these critters ain't so dumb after all.